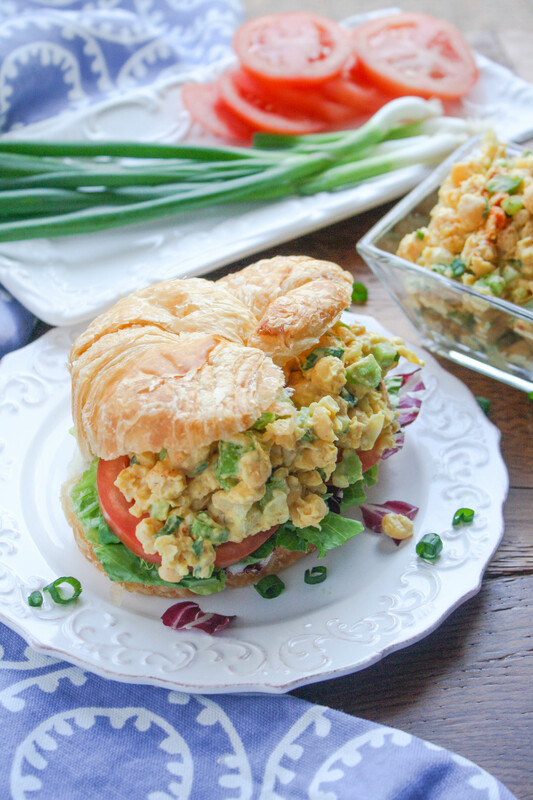 Chickpea Salad Sandwiches are great to serve for parties, picnics, or for a lunchtime meal. This vegetarian sandwich is similar to a traditional chicken or tuna salad sandwich, with amazing texture and taste. I originally posted this recipe back in 2012. My, how time flies! This is one of my favorites, and I haven’t changed anything except to update the photos. 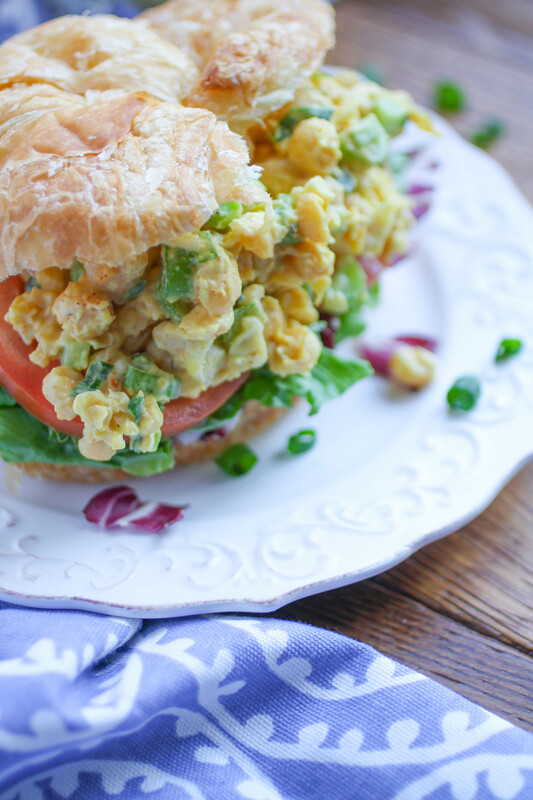 Way back when, I made these Chickpea Salad Sandwiches for my younger sister’s baby shower (my little niece just celebrated her fifth birthday). These sandwiches make a wonderful vegetarian option for a lunchtime party (or for your lunch hour at work). I love chickpeas! They’re so versatile, and good for you. For a hearty dish that includes chickpeas, try my Potato, Chickpea, and Spinach Curry. If you’re a fan of skillet meals like I am, you’ll enjoy my Creamy Skillet Swiss Chard and Chickpeas with Crunchy Breadcrumbs. If you’d rather just have a touch of chickpeas in your dish, try my Pasta with Rapini and Crispy Chickpeas. Bet you’ll have a hard time not snacking on them as you prep this dish! This salad, with its texture and flavor, was the perfect filling for the soft, buttery croissants that are always welcome at a shower. The chickpea salad sandwiches are filling (thank you, chickpeas), and include some crunch from celery and green onions. Only a few other ingredients — mayonnaise, mustard, and salt, pepper, and cayenne pepper — are added as a finishing touch. What’s a sandwich without some sides like salad greens, sliced tomatoes, and Swiss cheese? 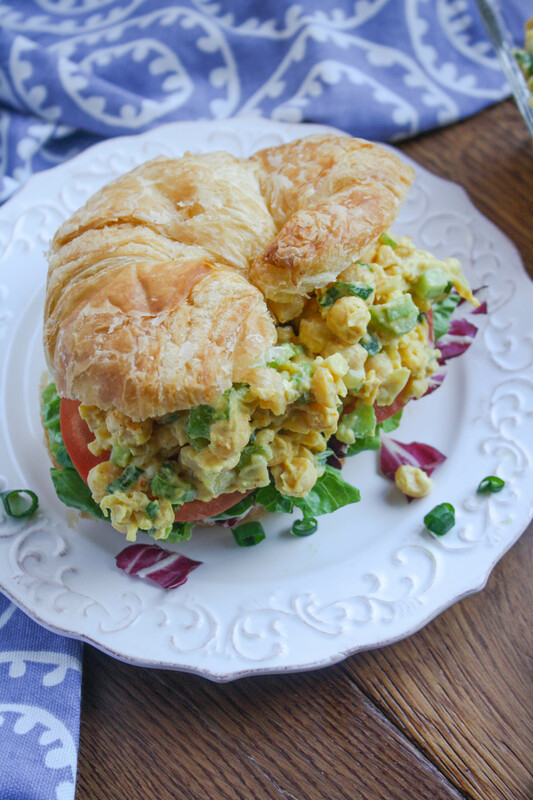 Chickpea salad sandwiches are perfect as-is, but I loooooove a loaded sandwich with all the extras! One of these days I need to mix things up and make a batch of this salad with dried cranberries and slivered almonds, but I just love the original version so much. It’s my go-to, for sure! Of course we had a lot of leftovers after the shower (my Italian family always makes more than needed). When the rest of my family got together later that day, we served leftovers, and sat on the deck eating, chatting, and visiting. The chickpea salad sandwiches were most definitely a hit, even with the little kids! 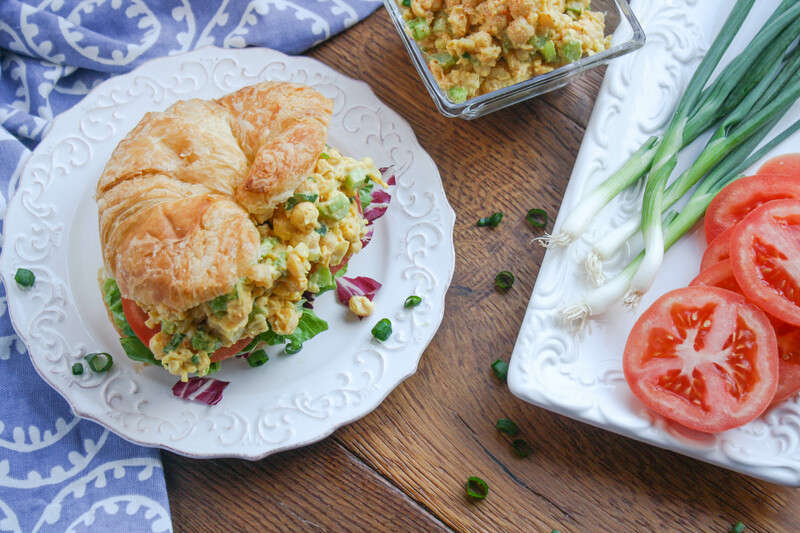 Make chickpea salad sandwiches the next time you you need a great lunch, or something fabulous to serve for a get together. Note: you can easily make this a vegan option by using your favorite vegan mayo. Add all the ingredients to a food processor and pulse a few times. If you don’t have a food processor, first mash the chickpeas in a medium-sized bowl with a potato masher, then add the remaining ingredients and mix well. Don't pulse the mixture too long, as you want the consistency to be a little chunky. After pulsing or mashing, remove and discard some of the chickpea skins you might find. Mix well, taste, and adjust the seasoning as needed. This are so good and I know I will be carrying them to school this year! One suggestion, learned after enduring too many soggy-bread tuna fish sandwiches, is to place the chickpea salad in a small, seperate container from the bread and then make the sandwich when ready to eat. I may try adding golden raisins. Yum! Good idea! I think you could even try adding hard boiled eggs, too! ohhhh you've got it going on with this one! I love chickpeas and had never thought of using them for a salad. I have 3 cans of chick peas in my pantry right now as well as all the other ingredients on hand, so I'm making this tomorrow for lunch! Great thinking! Awesome! Let me know if you like it - I looooove it! I only had one day's worth of leftovers, which kept just fine. Not sure if 4-5 would be too long for it? If I had to guess I'd say more like 2-3 days at the most. Wow, this was so delicious, Patricia! It’s become a favorite of my vegan family. Thank you! That's so great to hear, Erin! Thanks so much! Haa! Thanks so much, Holly - hope you get a chance to try it! 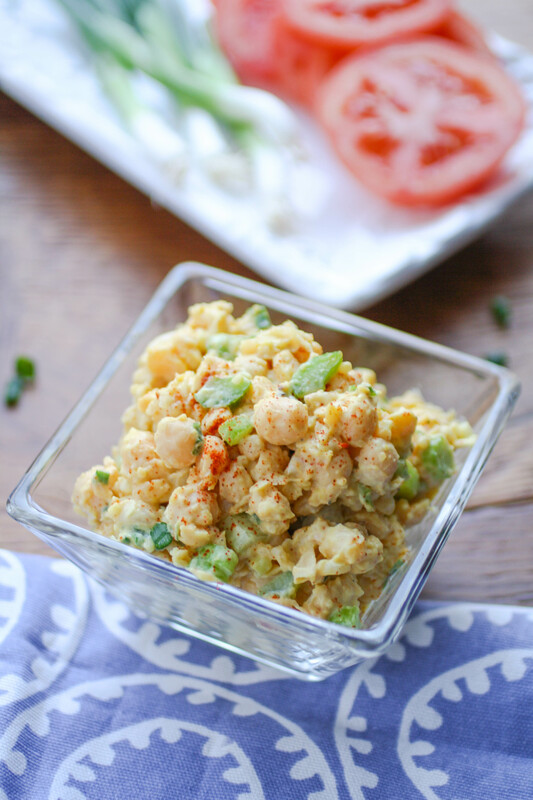 I like chicken salad and have been looking for more meatless swap recipes - this is perfect! That's great, Elyse! I hope you give it a try, and enjoy! Hope you like it!! Thanks so much! Hi Patricia! Your sandwiches look amazing! I was not hungry but after reading your post I became :-)Thank you for sharing! Haa! Then my job here is done, Helena! :) Glad you like this! Thanks for stopping by! This looks sooo yum! I love hummus so this will be a win! I really need to get a food processor! Thanks for sharing! Thanks, Marisa! Good news is that you can easily mash up the chickpeas with a potato masher or fork! Hope you give it a try! These sandwiches sound so good! What a great lunch! Thanks, Leah! Hope you give 'em a try! I can't wait to try this recipe - very healthy - and it looks so delicious! Such a great dish to serve at a party or to just make while you are at home. Thanks so much! Yes - it's perfect for parties, or just lunch! This looks soooo good! I feel like I could even get my hubby on board! How delicious! I never thought of chickpeas as a filling before. Hi Marissa! It's really good - I love this easy filling! That sandwich looks amazing! I've never even heard of chickpea salad, but what a wonderful idea. It's always nice to try new things and update old favorites like sandwiches. As always, your photos are incredible! This looks so creamy and delicious my family is a big fan of chicken salad and I am sure they will love this! Thanks, Soniya! You won't even miss the chicken :) Hope you try it! This sounds so yummy! Something I can defiantly see myself trying to make very soon! Thanks, Megan Anne! Hope you give it a try, and enjoy! Really great taste. Thank you.